Suzuki actually developed the Maruti SX4 for the European market but now it is available around the globe in different body shapes which includes hatchback for some part of the world, sedan for other and some special markets have SX4 crossover. 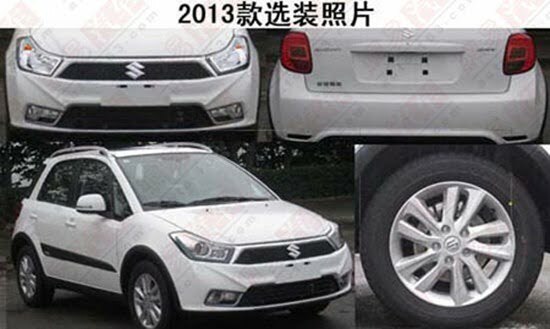 Last year SX4 was given a facelift in China and now some new spy pictures from China itself indicates Suzuki might introduce a new facelifted SX4 soon. SX4 has been in the market for quite a time now and last year received a minor cosmetic upgrade including a new bumper, chrome grill and updated headlamps. The changes were very minimal and now new spy pictures have hit the internet indicating another SX4 facelift on its way as the pictures are without any camouflage. The new SX4 looks no different but a little more ugly, the headlamps are more flat and angular. The rear is given a new set of tail-lamps and the updated SX4 also gets a new set of bumpers. Fogs lamps are also new and as no interior picture is provided so assumptions can only be made about the interiors. This will be the last update for the current SX4 as the Suzuki is planning an all new generation for the SX4. In India Maruti Suzuki will update the SX4 but will the current facelift model, the SX4 in these spy pictures will not be available in Indian. SX4 initially received a good response but with increasing competition and no major updates, the car is facing a rapid fall in the sale. A lot of people have even spied the new SX4 testing on Indian roads. Maruti Suzuki will not update the powertrain of the SX4 and will come with a 1.6 VVT petrol engine producing 105 BHP, a 1.3 litre diesel engine producing 90 BHP and a CNG variant too. If Maruti wants a larger share of the sedan market, it must do something with the SX4 soon as this segment is largely conquered by Hyundai, Nissan, Honda and Skoda. In fact, Maruti Suzuki is putting more of its energy in the small car segment and compact sedan segment with Maruti Swift and Swift Dzire being its strongest performers followed by the Ertiga MPV. We will keep you posted on new launches and updates from India car market, stay tuned.